This giveaway is now closed. The winner is Leah, which I am emailing now. If you read any frugal lifestyle, coupon blogs or anything like that, you are probably familiar with Crystal Paine of MoneySavingMom.com. She has one of the largest frugal lifestyle and coupon blogs out there and is also becoming a quite accomplished author. Even if you aren’t a coupon clipper, you would still benefit from her sales alerts, menu ideas, motivational posts on time management, saving money, setting goals, and more. Her blog is one of my daily reads! Last year she wrote and released her first hard copy book, The Money Saving Mom’s Budget . And she has released several eBooks as well – 21 Days To A More Disciplined Life , How to Make Money Blogging , and Time Management 101 . 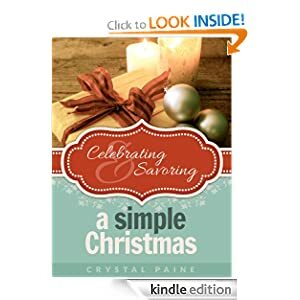 Today she released her newest eBook – Celebrating & Savoring a Simple Christmas and I am excited to give one copy away to one of my readers! And if you don’t want to wait, you can pick up a copy from today through Thursday for 99¢. Click here here to purchase your eBook. That’s it! Hope you win! Giveway will end tomorrow, Wednesday, November 14th at midnight. Saving money this Christmas by not spending more than I can afford, not financing anything… keeping it simple. Well we will probably have a quiet Christmas with just our immediate family as the husband will not have any time off from work before or after. Christmas is my favorite holiday and I am all about saving money and living simply. This book sounds like something I would definitely enjoy. I plan on spending a simple Christmas with family! I would like to have my Christmas presents made and purchased by December the 15th, so I can enjoy my children, while they are out for the holidays! My husband and I will probably be staying home on Christmas Day and enjoying time together as a family. It will be a relaxing, peaceful way to celebrate Christmas. I’m planning on celebrating a simple Christmas by making as many Christmas gifts as possible myself. We never spend a lot of money on Christmas presents, but this year our budget is tighter than ever– the perfect excuse to give handmade gifts from the heart! Kathryn recently posted..I’m In Love… Again! By making most of my gifts…I love to give handmade items! I’m planning on celebrating a simple Christmas by loosening control. Yep, found out I’m a control freak through a recent week long devotional series. Oh, yes I am. There, I said (wrote) it out loud. Through God’s grace I am striving to allow my family to make choices and decisions regarding decorating, meal planning, and gulp our activities. I too follow Crystal at MoneySavingMom and really enjoy her blog. This year we will have our oldest daughter and her family with us for Christmas. Santa will be coming to our house to leave our granddaughters Hannah (6) and Ily (2) some gifts so we are very excited! We play chinese christmas with a budget of $30-40 on gifts. It is fun and not expensive. We each bring a dish and we have fun celebrating. I plan on reducing the amount of activities we do and do more casual activities such as family walks. I plan to not overdo it with gifts for the kiddos. Something you want, something you need, something to wear, something to read. We keep the last few days before Christmas commitment-free so that I can bake and craft with our daughters. We are expecting our newest edition any time in the next three weeks and I plan on taking advantage of the newborn stage when I have to slow down to enjoy the joy in my children during the season. By faithfully observing Advent, I am able to keep Christmas in proper focus and eliminate some of the extraneous “stuff” that seems to happen during this season. Buying fewer gifts and enjoying more experiences will help our holidays be more simple. This year I plan to have a simple cozy christmas at home by getting everything done ahead of time so there’s no last minute running around.